The Life Fitness X1 Elliptical Trainer is ON SALE! The Life Fitness X1 elliptical trainer is their entry model. However, you are still getting the Life Fitness quality. Life Fitness, along with Precor, is one of the best elliptical machines available. And like Precor, the ellipticals are commercial quality for the home. What makes LifeFitness ellipticals better than others? The solid construction and the smooth and quiet elliptical motion. When you get on a Life Fitness elliptical you get spoiled. In fact, many people who use them in their health club find most other brands are a disappointment. The Life Fitness X1 with the Advanced Workout Console typically sells for $1,999 with shipping. 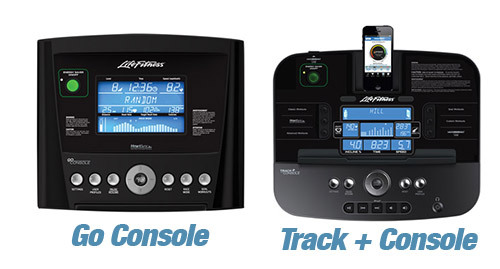 The Life Fitness X1 comes with a choice of two different consoles: GO console and Track+ console. The Track+ console is compatible with Android and Apple products. It also works well with popular fitness apps that allow you to exercise along a virtual course. The Track+ comes with 14 workouts, 12 custom workouts, and the ability to track 4 user profiles. The Go console provides a more standard LCD display with basic stats displayed, 12 workouts, 2 custom workouts and only 2 user profile slots. The X1 weighs a solid 215 lbs. You won’t have any swaying or bouncy like you will with other lightweight machines. The user weight is listed at 350 lbs., and although other brands make claims beyond the capacity of their machines, in regards to the X1 I would say they are close to the mark. The LifeFitness X1 comes with a comfortable 20″ stride. This is a what I consider a perfect stride length for an average to above average height individual. If you are under 5’4″, you may want to consider a smaller stride. Note that this is a rear drive elliptical, and many people find this preferable. What is the difference between front and rear drive? The front drive ellipticals tend to force you to lean forward, while the rear tends to better center your body . Also, most front drive machines have pedals that run on rollers. In general, there are more parts that are capable of wearing out. The Life Fitness X1 is not quite up to the standards of their commercial models, but it is still a quality machine. It would be equivalent to buying the entry model BMW 325. You are still getting quality, but in a smaller package. A popular consumer magazine rated the X1 Basic as excellent in construction and exercise range.